We’ve just returned from our second visit to Austria and stayed in Austria Holiday apartment in Kaprun, which is perfectly positioned and very comfortable. 1. 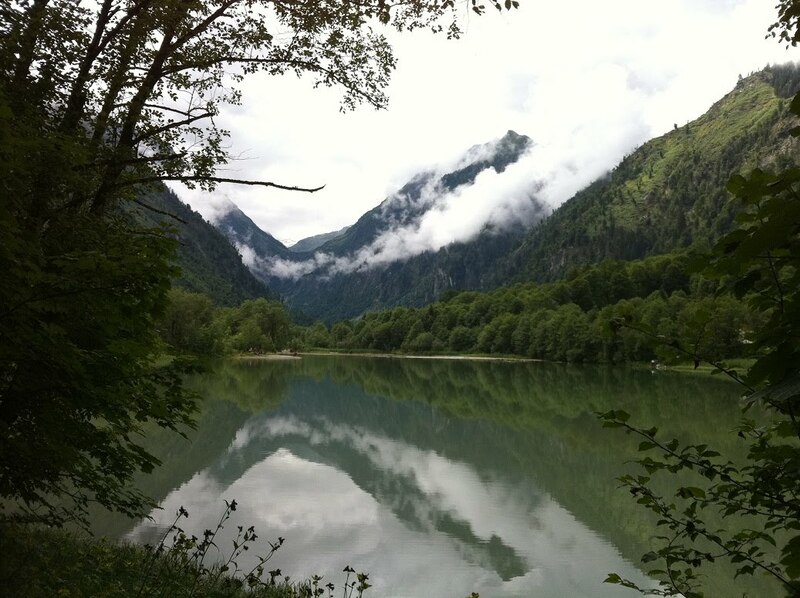 The main activities for us this year were walking and swimming so we purchased a Kaprun Zell am See “Hike and Swim” ticket for a total of €176. 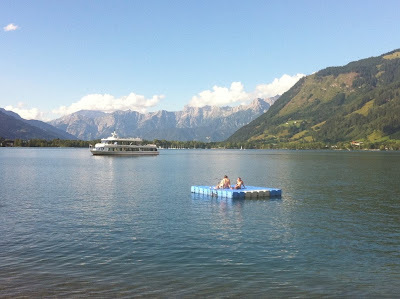 It might sound expensive but one return ride on a cable car is £40 and one visit to the lido in Zell am See is £20 and as we can manage both in one day it’s cost effective, it gave us "free" access to lots of the attractions in the immediate area. 2. Our first walk was one for the children “Schmidolin’s Feuertaufe”, it’s new this year and has a fire breathing dragon theme. There are 11 game action stations on a circular walk which is situated between the City Express (Mittelstation) and Areitbahn gondolas. We all enjoyed this walk (route no. 56) and the children loved it especially when they each received a certificate at the end, which they were both very pleased with. If we had more time we probably would have done it again. For more info in German click here, the English link is above. 3. The next day the Schmittenhohebahn wasn’t running but the TrassExpress was which runs to its left (this isn’t shown on the summer map but is visible on the winter map). We then walked up the mountain to the St Elisabeth church at the Schmitten summit where we then followed the very short Empress Sisi walk (route no.1). 4. Our next walk was from the top of the Schmittenhohe along the ridge to the Sonnkogel chairlift (Erlebnisweg Hohenpromenade, route no. 67). This is mostly downhill and there are multiple information points along the way (including tunnels to explore) which can engage the children and at the top of the Sonnkogel there is a zip wire and slide. Also here is a place where you can have your photo taken by the webcam, here’s ours! We stopped off for coffee and apple strudel at the café/restaurant and then took the chairlift ride down, which the children loved, at the end of which there is another playground. 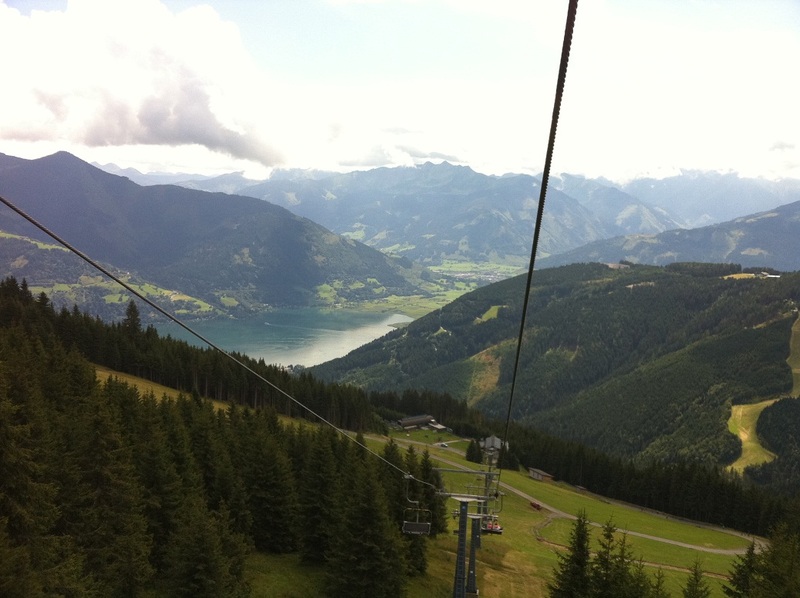 From here it is the Sonnenalm cable car back to the car park. 5. On a cloudy and wet day we drove the one mile up the road from the apartment and paid €8, for 4 of us to walk through the Sigmund-Thun-Klamm gorge which is very impressive. From the top of the gorge we walked around the Klamsee (lake) and then drove a very short distance to take the Maiskogelbahn cable car. This is like stepping back in time and at the top by the café there are swings, a number of animals for the children to see (goats, ponies, chickens) and also great views looking down to Kaprun towards Zell am See. 6. 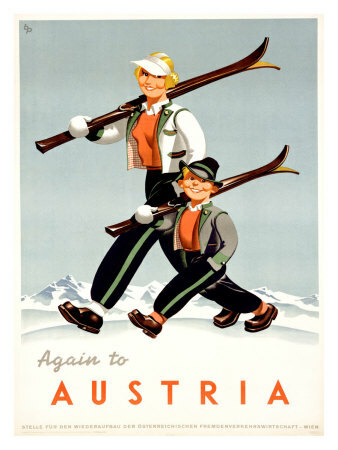 Our next trip we gave the children the choice of either taking the train and; bus to the Krimml waterfall or visiting the ice cave at Werfen. They chose the ice cave so that’s where we went. This is approx 45mins from the apartment in Kaprun. We would advise going as early as possible in the day because we had a lot of queuing. When we arrived at Werfen, near the impressive, imposing castle, we were told to park in the lower car park and take the bus to the ticket office, whilst this cost us an extra €16 in hindsight it was money well spent because the drive up the mountain to the ticket office is not for the uninitiated (steep narrow hairpins avoiding buses for 5km and a narrow busy car park at the top). We paid £50 for our cable car/ice cave ticket and took the 20 min walk to the cable car, which leaves every 3 mins but can only carry 15 people at a time (so a long queue takes time to shift). There is then another 20min walk to the ice cave which itself has hundreds of steps (I felt dizzy for a short period as we got to the top but our children didn’t complain at all). 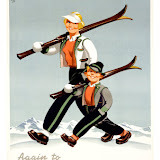 Warm clothing and good footwear is essential. The ice cave is amazing and is only lit by lamps carried by the visitors and magnesium carried by the guide who also speaks English and German. 7. When we weren’t walking we were mainly swimming at the lido in Zell am See which has great facilities. Here we all used the pools, the water slide and swam in the lake. Whilst our children aren’t old enough yet they enjoyed watching the teens being towed by the speedboat on the doughnuts and the banana (and falling off). The views around the lake from here are fantastic, I bet there aren’t many other better situated outdoor swimming pools. We also used the indoor pool in Kaprun but I expect the new Tauern Spa Kaprun resort due to open in November will be much better. 8. 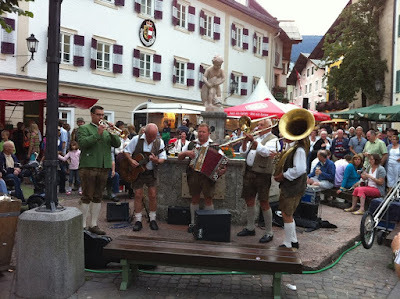 There is a great atmosphere in Zell am See on Wednesday nights during the summer with music bands, lots of food and drink stalls and entertainers including clowns making balloon animals. 9. As we had a late flight back to the UK and the weather was poor we drove into Salzburg and visited the Natural History/Science museum which was fascinating for us all. We spent approx 3 hours inside, there are a number of floors with rooms featuring dinosaurs, the ice age, science, space exploration and the Doppler effect, evolution, aquariums amongst others. 10. On a sunnier day we probably would have gone back to Hellbrunn on the outskirts of Salzburg (also adjacent to the zoo) – this has lovely gardens including the summer house from The Sound of Music (“I am 16 going on 17”), a great play area and a house with incredible fountains (see also ). 11. A mountain bike festival in Kaprun, "Bike infection 2010"for links for action packed cycle videos click here. The date set for 2011 has already been set, and looks to become a regular occurrence. 14. 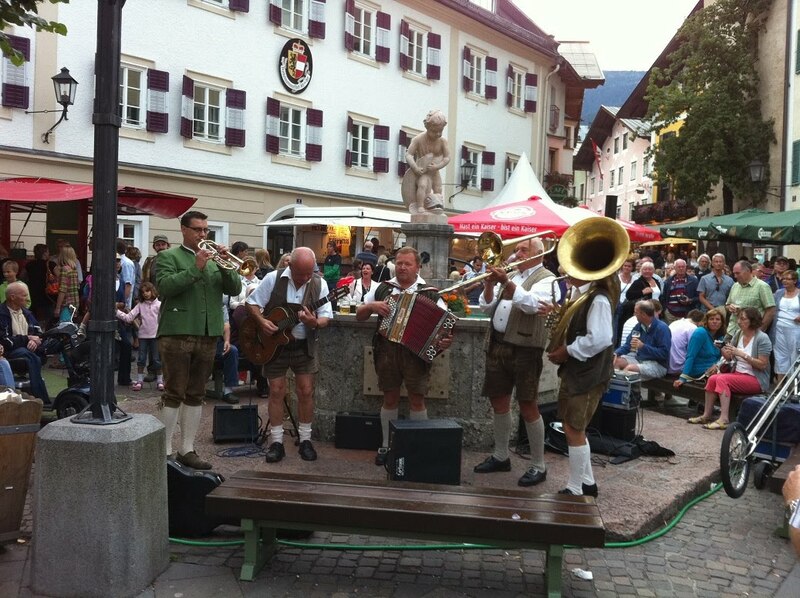 Parking – is free on the roadside in Zell am See on Friday afternoons, all day Saturday and Sunday and after 6pm on other weekdays. At other times it is very cheap but the maximum stay is 3 hours. It also is very busy so spaces are rare but it is a much cheaper alternative than the underground covered car park. In Kaprun the parking is much easier and parking was free at the apartment where we stayed. Whilst this has been our second visit we still have plenty more to do including the Kitzsteinhorn glacier the Kaprun dams and reservoirs; the train ride upto Krimml waterfalls, cycling around and boating on the lake; the spa, walks and castle in Kaprun; Saalbach-Hinterglemm etc. etc. etc. Looking forward to returning again sometime!